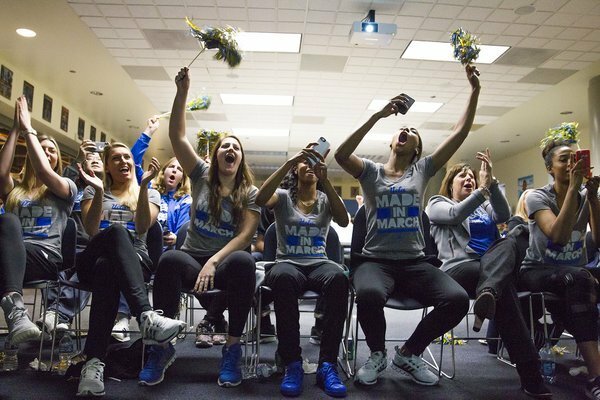 UCLA players and coach Cori Close rejoice at their third seed during Selection Monday. Photo courtesy of UCLA Athletics. Cheers greeted the traditional roll call of team names on Selection Monday. Around the country, Division I teams were named, seeded and placed into the NCAA Tournament bracket in preparation for opening day on Friday. Unlike some years past there were few, if any surprises. 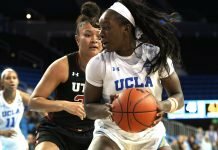 At UCLA, the 24-8, third-seeded Bruins learned that they’d host rounds one and two of the Bridgeport regional, and that they’d face Hawaii in Saturday’s first match up. Power house South Florida will take on Colorado State in game two. UCLA coach Cori Close, whose teams have played in the Tournament before, called the invitation “a privilege that never gets old.” She said the Bruins relished the chance to play on their home floor. Close isn’t looking any further ahead than one game. 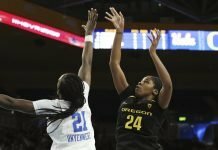 UCLA ended the regular season in roller coaster fashion, as they soared to an overtime Pac-12 Tournament semifinal win in dramatic fashion, and were crushed by Oregon State the next night in the championship game. Close said she takes responsibility for not bringing the team “back down to Earth” in time for the title game. Star guard Jordin Canada called it a learning experience. Last year the Bruins won the WNIT. Canada said it was exciting to see UCLA selected live on national television. 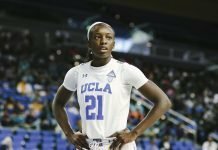 Though UCLA will have to learn Hawaii as a team, Canada already knows guards Briana Harris and Destiny King – both Southern California natives like herself – from her club ball days. Texas got their highest seed in many years in the Bridgeport bracket, at No. 2. Like the Bruins, the Longhorns get to host this weekend. Coach Karen Aston is excited about both the, and the program’s progress. Aston is also guiding her players to take on one game at a time and not look ahead. BYU won the regular season West Coast Conference title, but were upset in the tournament final by San Francisco. On selection night, they received a No 7 seed, and will play No. 10 Missouri in the Bridgeport regional. Coach Jeff Judkins had jitters Monday. Oklahoma State celebrates their NCAA Tournament selection. Photo by Bruce Waterfield/OSU Athletics. 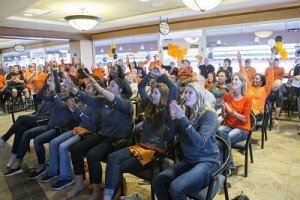 In the Dallas regional, Oklahoma State was selected and given a No. 7 seed, and will face No. 10 St. Bonaventure. This marks coach Jim Littell’s fourth NCAA Tournament appearance with the Cowgirls in as many years at helm of the program. Littell said earlier this season that he’s not coached a closer team in three decades in the business. Star guard Brittney Martin said the team is very motivated right now. No. 11 James Madison, the Colonial Athletic Association regular-season and tournament champion, will face No. 6 DePaul, who was upset in the Big East Tournament, in the Dallas bracket. Dukes coach Kenny Brooks said it will be a tough challenge that he relishes. “We know we’re playing one of the better teams in the country and one of the better coaches in the country in Doug Bruno. I’m looking forward to that opportunity because he’s somebody that I consider a mentor and someone I want to model my program after,” Brooks said. In the Sioux Falls regional, No. 8 George Washington will square off Friday against No. 9 Kansas State in what promises to be a hard-fought match up. The Colonials returned 13 players from last season, when they lost to Gonzaga in the NCAA Tournament first round. Coach Jonathan Tsipis said his team has grown a lot in a year, and will be ready for the Wildcats.